Cold Chain is a general term used to describe handling of temperature sensitive products. The entire chain events the manufacturing plant (eg. a medicine) to the end customer (eg. a customer at the pharmacy) are covered in the Cold Chain. In the case of a medicine, it will go through multiple countries, multiple modes of transportation etc. The medicine should be stored at the specified temperature under all sequence of events. Data loggers which will record continuously and indicate and display alert levels. The customer can download the readings and can view at the end of the journey. Real Time temperature monitoring for vehicles by transmitting the temperature data through GPS/GPRS mode. Recorders with printers mounted inside the cabin. The driver can print a report at any point of time during the journey. Portable printer with data logger is a battery charged printer. 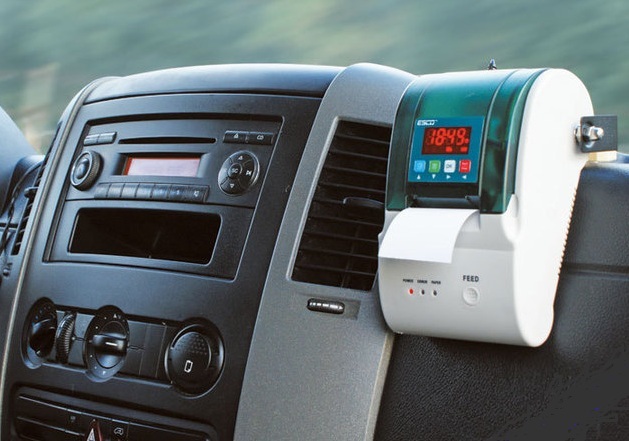 A driver can take the data logger and the printer to a customer to give a printout of the readings. 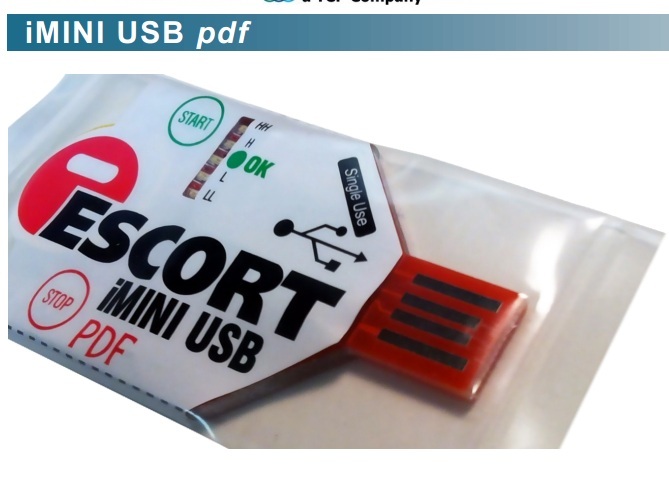 This device similar in size to a normal USB. We can place the logger inside the container while commencing the journey which will record the data continuously. At the end of the journey, the end user can insert the USB temperature into a PC. This will generate data recorded throughout the journey in the form of a pdf or Excel report. Also, the device has LEDs which will indicate whether the temperature exceeded the desired limits during the shipment. The device can be programmed for following parameters. Sampling rate (interval between recording data). Two lower limits and two upper limits of alert levels. The delay duration for these alert levels before the LEDs start blinking. minutes. There is a ‘Start’ button to start recording and a ‘Stop’ button to stop the recording. The device is simple to use and does not need any proprietary software for generating the report. The temperature Range is from -40 ⁰C to +80 ⁰C (-40 ⁰F to +176 ⁰F). The user can program the sampling interval from 5 seconds to 17 hours. The resolution of recording is 0.1 ⁰C (0.1 ⁰F). There are 4 alarm Thresholds ie. 2 Red LEDs for the upper limit, 2 Blue LEDs for lower limits. The size of the data logger is 68mmx37mmx5mm (without sleeve) and 81mmx52mmx5mm (with sleeve). The alarms are HIGH HIGH, HIGH, LOW & LOW LOW. Please read more on disposable temperature data loggers. 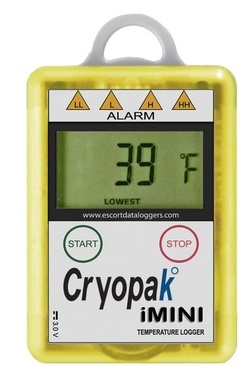 This series of the data logger with a display is available in single-use or multi-use models. These are having Start and Stop buttons and an LCD display. There are four LED indicators on the top of the data logger to indicate whether the temperature and/or humidity exceeded the programmed levels during the shipment or storage. There are five different models with varying memory options from 8,000 to 128,000 readings. Also, there are numerous models with internal and external sensors or a combination thereof. It can measure temperature from -40 ⁰C to +80 ⁰C (-40 ⁰F to +176 ⁰F). The user can program the data logger for different recording interval from 5 seconds to 17 hours. The resolution of reading is from 0.1 °C / 0.1 °F / 0.1%. IT can have 4 separate alarm Thresholds ie. 2 Red LEDs and 2 Blue LEDs. The size of the data logger is 83 x 57 x 17mm (excluding lug). The possible alarms are HIGH HIGH, HIGH, LOW & LOW LOW. It has an Ingress protection of IP65 (with its plastic cap over USB connector). Read more on Data loggers. This is a GSM / GPRS based system through which we can monitor the critical parameters such as Temperature & Humidity. A cloud-based software will record the data continuously. The system involves a device with sensors installed in the vehicle. These sensors will continuously transmit the data through GSM / GPRS system. The system works with a normal SIM card with a data package. Also, the system can generate Email/ SMS alerts in c ase the critical parameters exceed the permitted levels for the defined duration. In the GSM based system, the data transmission is by means of SMS to a central receiver. A central software and convert the data for proper viewing in a graphical manner. A GPRS based system will transmit the data continuously as data packets. We can use such systems for monitoring of vehicles which transport medicines, vaccines, food etc. and for HACCP certification. Please read more on Real Time temperature monitoring for vehicles.